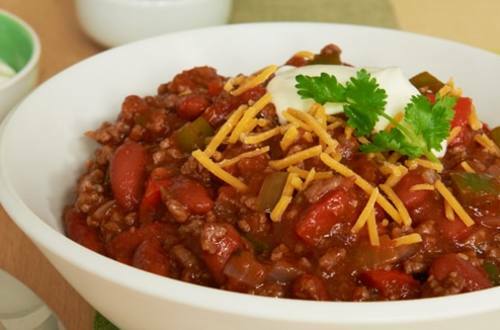 For cooked-all-day flavor in just 30 minutes, try our hearty beef chili recipe. Onions, peppers and chipotle chiles combine with beans and beef to give this cold-weather dish a hearty richness. The best part? It’s just as delicious the next day. 1 Cook ground beef, onion and red pepper in 4-quart saucepan, stirring occasionally, until beef is browned and vegetables are tender. 2 Stir in Knorr® Homestyle Stock - Beef and chipotle chile pepper* until Stock is melted. 3 Stir in tomatoes and beans. Bring to a boil over high heat. Reduce heat to low and simmer, stirring occasionally, 15 minutes. Serve, if desired, with shredded cheddar cheese, sour cream and/or chopped cilantro.